PlayStation Home’s E3 Booth an Enormous Success + Toy Story 3, Community Events, and More! Needless to say, the virtual E3 Booth event space has been a tremendous success. And we have you, the 14 million users that make up the illustrious PlayStation Home community, to thank for that. We have tremendous momentum coming out of E3, and you can bet that we’re going to continue to come correct and deliver the content that you demand between now and our next big event. This week, we are releasing a brand new personal space based upon Disney-Pixar’s third installment in the critically acclaimed Toy Story series. “Andy’s Room” transports players to the world of Buzz Lightyear, Woody, and the other toys owned by Andy Davis. Packed with mini-games and fun interactives, Andy’s Room is a must-have addition to your personal space collection. 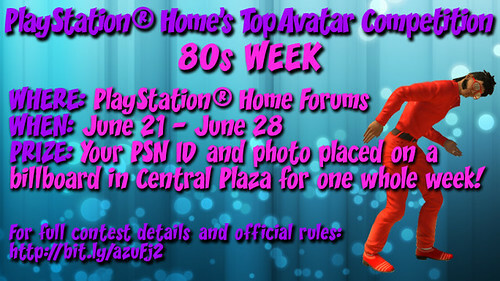 Pick yours up this Thursday from the Estates store in the PlayStation Home Mall. In the meantime, check out this video we’ve scored that highlights some of the key elements of the space (Note: Some of the virtual items that are shown towards the end of the video will be released over time — stay tuned for specific release dates). In other Toy Story 3 news, be sure to head to the PlayStation Home Theater this Thursday to load up on some exclusive Toy Story 3 virtual item rewards. All you have to do is watch the Toy Story 3 footage and — voila! — Toy Story 3 t-shirts will magically appear in your wardrobe. Pretty cool, eh? The recently released Playground space is a smash hit, with tons of users gathering in this highly immersive space to partake in games of H-O-R-S-E and chess, party of the rooftop lounge, and enjoy the high-quality, original hip-hop and funk music circa-1980 that is blaring throughout the space. Come this week, you’ll be able to bring the party back home with the Playground Boombox, which allows you to take the music of the Playground space to your personal space for your own private bash. A first for the platform (the ability to play music in personal spaces and clubhouses), the Playground Boombox will be available on Playground Boombox this Thursday, June 24th from the Furniture store. Finally, the Sodium store will be updated this week with additional female clothing items and furniture, and the popular Dog and Cat suits will be released as well. Check the Latest Update tab under the Community section in your Menu Pad on Thursday for a complete list of the newest content. Any chance that we could use Music off our hard drive while browsing Home? You could even give us something like a walkman so we’d have to have it on our Avatar to enable the music streaming. That would be a nice feature. Will the Darts game for our personal spaces and apartment UFOs be making their way to the Mall this week Locust_Star? Definitely checking out the Toy Story 3 space :) It looks great! Congrats on your huge success!- Really! Although, I wanted to know if there is any way that I can retrieve the second item from Day Two? Because that was the day I visited, but I apparently did not get the item (E3 2010 Sofa). I don’t know why it did not appear in my inventory list or reward list, even though I visited, viewed and did necessary steps in order to obtain those items… Can you please help me out with that one? Please? Also, I am looking forward to see whatever you plan to bring surprises on the table. I know they will be HUGE and you will have a HUGE SUCCESS with them! Keep up the good work! The rewards are once again available in the E3 Booth for today only (we’re pulling the space down tomorrow), so get in there now! So we can have the Playground’s Music in our spaces?! Just awesome! I can’t wait for it. Great news on the E3 success. It really is an awesome space and experience. Looks like a really good week, are we getting those cool World Cup Puma and Umbro jerseys here too? I really hope so. Those Toy Story costumes are awesome. I definitely want the Buzz Lightyear wings. I agree. Do note that those costumes are not being released tomorrow, but will be available very, very soon. Any word on HCVs yet? For today only (6.23) we are able to visit the E3 space and get ALL of the rewards! – Check it out, before it’s gone tomorrow. I hope the sodium store update has long hair for us ladies! No new hair this week, but skirts and high heels. How much for that Playground Boombox? Can’t wait to grab that boombox! Music in personal spaces is here! Now new need some media streaming going on. Keep up the good work HCM Team. Great stuff this week already! And I can’t wait until more personal space portable arcade games and pool tables come out. Cabin Boy: Trout trouble was pretty cool. Thanks! Crap, wrong link. Please erase the other. https://blog.eu.playstation.com/2010/06/23/playstation-plus-explained/ – Found this on N4G, now could you do me a favor and ask someone who would know the answer to this question. If you download a PSN game offered free for download during PSN+ membership, will there be an option to purchase that game (at a discounted price even) to keep? Wait a minute, Sodium store as in the Mall or the Sodium credits shop in the Sodium one space? As in the Mall. Sorry for not being more clear in the post. Awesome LS! I can’t wait to see them, omg lol Everything sounds great but this is awesome now with the jerseys! Sorry – I’m trying to track down some answers for you right now. When I get word on those items, I’ll be sure to let you all know! So many “first time ever items for home” this time around. until sony fixes the major lag problem in home, i’m not going to waste my time trying to do anything in home. When was the last time you logged in? With our 1.35 and 1.36 core client updates, we’ve managed to greatly improve the navigation process in-world, and have drastically cut down on load times. If you haven’t been in recently, we encourage you to give it another go. I have to say that I don’t use Home often but lately I’m checking the updates often. I’m still having problems to receive my reward items from PixelJunk Shooter though. Also, I think some kind of video-tutorial for newbies will be great. Home can be really overwhelming the first time around. I always wondered what it was like to experience to Sony’s E3 Booth. Thanks! sony does not listen to us, so stop saying it was our idea for this and for that. if they did listen to us, by now we would have what we really wanted in Home. We can’t develop everything everyone asks for over night. But we deliver what we can as quickly as we can and remain committed to making the community’s vision a reality. This is clearly evidenced by not only the E3 Booth, but the portable arcade games and music in personal spaces – both of which have consistently ranked within the top 5 requests we’ve received from our users since the launch of Open Beta. Have a little faith, my friend. What a fantastic update! I atually just went to see Toy Story 3 last night…love the series and I’m so glad to see that some of our favorite Disney/Pixar friends are making their way into PlayStation Home. What fun!!! I’m gonna feel like a kid again!! Thanks, guys! Oh noes i didn’t get into that booth, i will later though. And to the comment above i disagree i think they research abit into the community most companies do however many issues can prevent or delays those features or other projects. I think it would be nice of Sony/Zipper to make the audio of the SVER radio available to personal spaces. How many people can jump on the bed at the same time ? @S-E-G All of these ideas were taken from an E3 suggestions thread that they started a few months ago in the PlayStation Home General forum. Thanks again for portable arcade games, more inventory items such as dice and music in personal spaces!!! Awesome work guys! I liked the idea of a virtual E3 booth, but why didn’t you think about including some 3rd party booths as well? Would’ve loved to see Square’s. Also when is Home coming out of “beta”…if ever? I’m sorry, but the booth wasn’t a success. It was a total waste. If you could actually play the demos it would have been awesome. waiting in line to watch a trailer I could get in better resolution elsewhere was pointless. Getting there to check it out just to find out I already saw everything there in better quality on Gametrailers was a huge letdown. Help me please! I went on PlayStation Home today and entered the E3 Space and did not get a sofa. :-( I went in the VIP area and still nothing. So if I don’t get the sofa will it be on sale in the Furniture store? At FredNation, you need to go up to the VIP area and watch the video on the big monitors for a few seconds, or just hang out in the VIP area for a few minutes, I’m not sure which one exactly, but doing that will get you your sofa. @krae_man I thought they did a great job on that E3 boot space, I it looked like the real thing. It’s seemed pretty cool and energetic. Did you get all the cool furniture rewards there? are you serious, guy? that Cabin game thing is half a step in the right direction for games in our personal space, but what we Really want are things such as a small bowling alley, poker tables, or the pool table that was originally advertised for personal spaces back when Phil Harrison was in charge. And we want to use our OWN music from our HDD’s to stream music into our personal spaces, not some crappy, generic 80’s type noise from the Playground space. Stop trying to twist our words around and Stop trying to tell us what we want. S-E-G is right, you guys aren’t Really listening to what we Really want. OH thank god, we are finally getting fursuits on US Home! I loved the Cat and Dog costumes I saw in the Global Lounge, will ours have the cool swaggers too? So LS when is Party Mic Chat ( chatting with more than just two people on microphone. ie: myself and a friend) for Home coming in Public Spaces? This I have been wondering for many many months. Thanks.